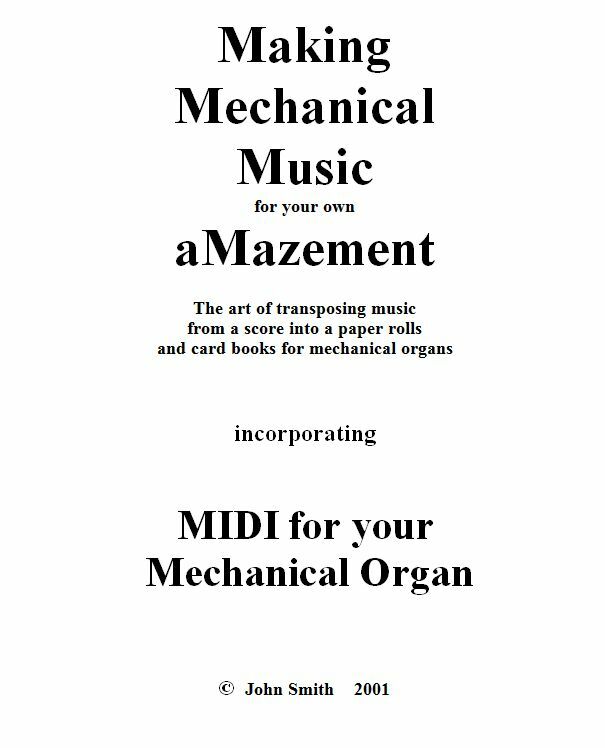 This is a little booklet which explains the process of turning sheet music into paper roll music for your Busker Organ - or any other mechanical organ, as the techniques are the same. No previous knowledge of music theory is needed, as everything you need to learn covered. This was demonstrated by the first purchaser, Brian Mahaffey of Northern Ireland. Brian knew nothing at all about music, yet within one month he had not only produced two rolls of music, but had also 'pinned' the barrel of a mechanical harmonium with eight hymns. He had converted this instrument some years previously, but had never been able to find anyone able to 'pin' it! Being Irish, the eight hymns became nine when the local priest came to hear it working, and he thought that the last tune was 'lovely', although he could not actually recognise it. This was not surprising, as Brian had actually played the last one backwards! This effect apparently often works with simple hymns. Rather than making paper music rolls, the musical information described in this booklet can also be used to create MIDI files. However, MIDI creation software can be very daunting for the casual user - especially as the latest programs are so powerful, with so many functions, that it can make it difficult to find the few simple steps we need for our single channel files. The new text explains MIDI itself, in simple terms, covering just the parts we need to know about, and then goes on to describe the steps needed to make a MIDI file using an early version of a program called Cakewalk. Of ourse, similar steps could be used in later, more up-to-date and sophisticated versions, but I have found the one I have to be easier to use, and perfectly adequate for our needs. Details of where to download this version of Cakewlk are included in the booklet. 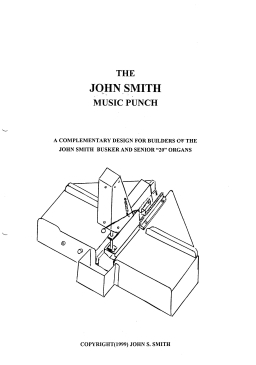 To complement the MMMM booklet, John also has plans for a punch. This can be either hand-operated, or operated by the use of a solenoid to give a fast effortless action. This is a well-proven machine, but its construction requires some basic metalworking skills and includes a small weld. Alternatively, it can be made from wood, and a number of these have been made, and operate successfully. John has been using the prototype for about ten years now, and must have cut the equivalent of hundreds of rolls - usually cutting six copies at a time. The test rolls supplied with the plans for my organs are produced with this machine. The punch is shown working at the end of the Busker video, but when filmed, it was fitted with a large mains-powered solenoid which had a slow recovery time, so the action is quite slow. 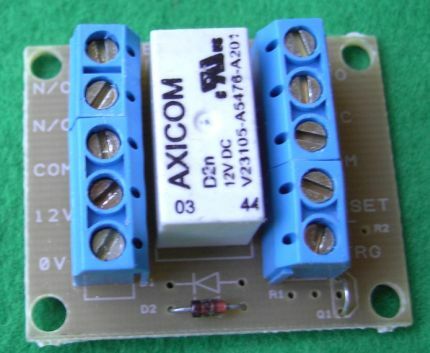 With a more suitable solenoid, the action is as fast as you can push the button! The above items are priced at £10 each, but both can be ordered together for just £16. A number of Topsy 3 organs are now under construction, and feedback to me has been very positive so far. However, the electronic options involved are proving a bit difficult for some builders - which may be no surprise. So, to get Topsy 3 off to a good start, I have produced some ready-made parts and control boards. - with preset controls for Tremulant speed. Built on a compact, double-sided P.C. and a wiring layout diagram will be included. 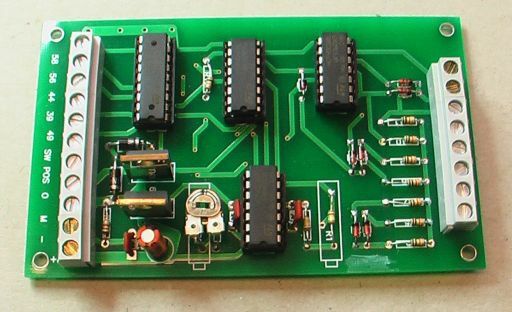 This board provides complete protection - without fuses blowing! This is a handy little board. can be made using 8 of the the screw terminals. 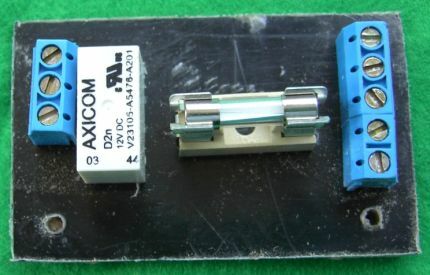 The 2 spares can be used for other terminations. only available to original Topsy 3 builders for their personal home use. that usually prevent things like these being made available.